Equality Service has submitted complain to the Vilnius local prosecutor’s office regarding the controversial label on the shirts, which were worn by some of the participants of the Family Reunion AWPL-ZPL in July. 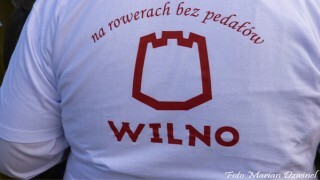 In the opininon of experts on equality, the slogan: “Vilnius – on bikes without pedals*” is discriminating to homosexuals. “The document was sent to the local prosecutor’s office on Friday” – informed Danguolė Grigolovičienė, representative of the Equality Service. “Information with provocative connotations, included on the T-shirts of some of the participants carries negative emotional evaluation, it instigates limitation of the rights of homosexual persons (…) thus, the decision concerning commencement of the pre-court investigation relating to alleged criminal actions is appropriate” – it was written in the application from investigation, which was conducted by Equality Service. The Service failed to assess, who ordered the production of the T-shirts and what is the real meaning behind the label. Penal Code provides that public bullying, insults, incitement to hatred or instigation to discrimination of a group of people or a person on a sexual, racial, national, lingusitic, social, religious, ideological background is endangered with fines or a restriction of liberty or imprisonment for 2 years. AWPL-ZPL Family Reunion took place on 11-12 July 2015. Photo relation from the festival apperared on the internet and social media. Somebody paid attention to identical T-shirts that were worn by the paricipants. New, official logo promoting the Lithuanian capital (stylized Gediminas tower) and the label: “Vilnius – on bikes without pedals”. LGBT communities in Poland and in Lithuania considered that it cannot be let off. Tłumaczenie by Agnieszka Galek	w ramach praktyk w Europejskiej Fundacji Praw Człowieka, www.efhr.eu. Translated by Agnieszka Galek	within the framework of a traineeship programme of the European Foundation of Human Rights, www.efhr.eu.